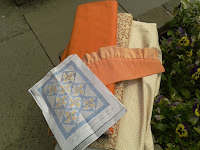 Hazel's Quilts: Starstruck - Fabric Bought! Firstly, thank you for your help and advise on fabrics on my last post, girls - I've taken it all on board and been to our LQS to compare to what I found last night at Hobbycraft (I only looked, and didn't buy last night). I've ended up with these, and hope that I've done the right thing! I think that this is why I am scrappy quilter by instinct - if I find I have a block that doesn't work, it's not a big deal - if I find that I've just made an epic howler on yardage for a whole quilt, that's £45 up the swannee, by today's shopping bill. If this had been my quilt, I would have gone for green with the peach, but should the quilt's new home be a peach/blue room, the green would not be a great move (and vice versa, I guess), so hopefully my choices will go with whatever it has to go with! The plan is to use the strong peach as the main fabric (it's come out a more orange in the pic than it is in real life), the patterned mid tone for the 'accent', and the cream with beige small markings for the background. QuiltSue has very kindly offered to work out a revised cutting list for my plan of using 10" not 12" blocks; which will bring the width in a bit; then I'll insert a row of flying geese top & bottom before the border goes on to get the proportions right for this single bed quilt. So that's the difficult bit done, finding the fabric; now for the exciting bit - don't you just love starting a new quilt! It looks lovely Hazel - and how wonderful of Sue to do the math for you. Thank you, Lesley - the fabric selection drove me mad! Very nice choice of fabrics. The tonal fabric fits well. Sue is a love to do the quilt math. I got myself in such a knot over the fabrics until I went for a walk round (the block, as it were) and realised that Niece Eleanor wasn't going to give too hoots as to whether I chose beige-on-cream or peach-on-cream for the background fabric; she's going to see the whole, and that's it. Well done Hazel, I think those colours are very smart. I was going to offer some apricot scraps if you had gone down that route, but I think your choice is great. Looking forward to seeing the progress. The truth of the matter is that the timescale of this one is important to my Godmother, who is not well. I hope to turn the project round to completion in less than a month - which might not sound too ambitious to the more experienced quilters here, but will be challenging enough for me to work to. Very wise choices. Can't wait to see the finished quilt. Are you done yet? Thank you for the giggle of the night, Sunny, and I'm grad you approve of my fabric choices!